Hall: with a tiled floor, bench seat, coat hooks and double doors through to the sitting room. Kitchen/breakfast room: a lovely light and spacious room overlooking the gardens to the front and rear. There is a fitted cream kitchen with ample cupboard space and a walk-in larder, well-equipped with an electric Rangemaster, built-in dishwasher, microwave and a free-standing full-height fridge/freezer. There is a large kitchen table with eight comfortable chairs. Cloakroom: with an oval hand basin and WC. Sitting Room: with windows to the front and rear overlooking the gardens. It has an attractive brick fireplace with a wood burning stove, two large sofas, armchair, flat screen TV, DVD player, sideboard with table lamps, coffee table and French doors to the terrace. There is free Wifi provided in the house. The stairs are not steep and lead up from the hall. En-suite bathroom: Bath with shower attachment, separate walk-in shower, hand basin, WC and a heated towel rail. Bedroom 2: Attractive room overlooking the back garden with a pretty wrought iron double bed, bedside tables and lamps, chest of drawers, dressing table and a built-in wardrobe. Bedroom 3: Overlooking the front garden with a double bed, bedside tables and lamps, chest of drawers and a built-in wardrobe. Bedroom 4: Pretty room at the front with a single bed, bedside table and lamp, and a chest of drawers. Shower room: Fitted with a walk-in shower, hand basin, WC and a heated towel rail. Field House is quietly located off Church Lane behind a five-bar gate with a large shingled drive with ample parking space. The house is situated in good-sized gardens surrounding the house which are mainly lawned and have been well-maintained with an abundance of shrubs and plants. The rear garden is fully enclosed with a high wooden fence and there are wooden side gates separating the back from the front garden. There are patio areas with garden furniture and a gas barbecue. The Duck Inn and a children's playground are both approximately 5-10 mins walk away, with the unspoilt North Norfolk coast only 10mins drive away. A lovely clean, well equipped house, done up to a high standard. Good location (love that it is walking distance to the delicious Duck Inn!). Well equipped, especially the kitchen/boot room area. Pretty garden and good outside table and bbq area. It was a lovely touch to leave a bottle of Rose wine and Genoa cake which was yummy. Thank you so much. We had a lovely week! We really liked our stay in this very well equipped cottage which felt really homely, it was very clean and well presented when we arrived. We have stayed in many cottages in the last ten years, this is one of the best. We would stay again. 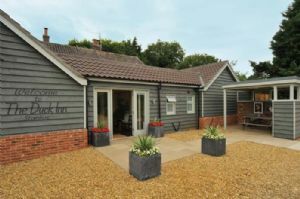 If you would like to see more of our holiday homes in and around the Norfolk coastal town of Stanhoe, please click here.